"Workin' 9 to 5, what a way to make a livin'. Barely gettin' by, it's all takin' and no givin' ..."
Dolly Parton's popular song "9 to 5" from 1980 lamented the difficulties and stress associated with having a traditional workday. But, an eight-hour day of working 9-to-5 really is not that bad — especially for your health. Several recent studies show the impact of work hours on health is related to the number of hours that are worked and also what time of day the work occurs. An analysis in The Lancet showed that longer working hours for those in lower socioeconomic groups has been associated with a higher risk of Type 2 diabetes. 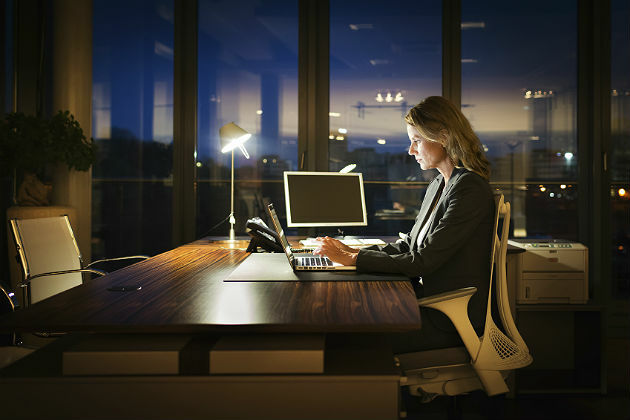 In another recent study, reseachers investigated the association of night-shift work history with cancer and cardiovascular disease among 54,724 women. The group found a strong association of health problems with shift work when the work schedule was undertaken after the age of 25. Workers who do not have a 9-to-5 schedule but routinely work other shifts are more likely to suffer general sleepiness and insomnia. Shirt work has been associated with decreased productivity, reduced safety and adverse health. Health consequences include increased risk for metabolic syndrome, cancer, cardiovascular disease and diabetes. The more years of working an irregular schedule, the greater risk of detriment to health, reported Varsha Vimalananda, M.D., a board certified endocrinologist in Boston. Vimalananda and her team followed 28,041 participants in the Black Women's Health Study. Over the eight years of followup, they found that a longer duration of shift work was associated with an increasing risk for Type 2 diabetes and the risk could not be explained by lifestyle or body mass index. There is increasing evidence that those undertaking shift work and those with sleep disorders are at increased risk for Type 2 diabetes. This is supported by research that finds disruptions of a conventional light-and-dark cycle or sleep-and-wake cycle can impact the circadian functions of rhythm clocks in brain and other organs. The disruption can be associated with impaired glucose tolerance and type two diabetes. Work is being done to better understand the biologics that regulate circadian rhythm and the relationship to blood-glucose levels. A protein, cryptochrome, has been identified as contributing to the biological clocks of many organisms, including mammals. The practice of having extended work days and irregular hours such as shift work may have implications for the health of the American workforce. The Bureau of Labor Statistics report from 2004 provides data indicating that 15 million Americans work full-time shifts that are not the traditional 9-to-5 — evening shifts, night shifts and rotating shifts. The International Labor Office reports that in 2003 workers in the United States had work hours that exceeded Japan and most of Western Europe. The 9-to-5 work model does not look that bad. The Economist reports that the latest trend in the business world is for spending less time at work, and the work style of early predawn to midnight being discouraged in many companies. The health outcomes of a balanced work environment are being recognized as being beneficial to families. Understanding the impact of extended work hours and irregular shift hours on overall health and well-being is a first step to managing the consequences. It is important to make efforts to assure that those providing services other than 9-to-5 enjoy good health and are not at risk of "barely gettin' by."